at my kitchen table: Where the heck do moles come from all of a sudden? Where the heck do moles come from all of a sudden? Just as I always suspected! I know -- would you look at the nails on that thing. Kind of cute in its creepiness though. 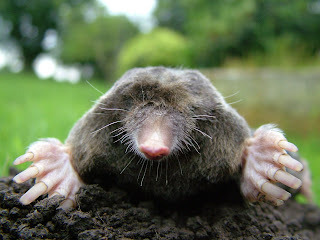 The best success I have had with getting rid of moles is using the bait and applicator from http://www.mole-be-gone.com.